Typical night at The Ja’s Climbing gym. To many people in the Western world, South Korea is known as the country of Samsung and Gangnam Style. What a lot of American climbers might not realize is that Korea is also home to a vibrant climbing culture. With more than three-quarters of its landscape covered by mountains — and possessing a population that is generally active — Korea has always had the base elements for a hip climbing scene. Several additional factors in recent years have propelled the country’s collective interest in climbing to a higher level and brought about an influx of new bouldering gyms. The indoor climbing boom is reflected most obviously in the recent establishment of the Korea Sports Climbing Wall Association, a new organization that was formed to provide a united voice and collective consciousness for gym owners across the country. At its inception in July, the association had 142 gym owners as members — a remarkable number of initial affiliates considering that the whole of South Korea is roughly the size of Kentucky. “The association was established to meet the increasing needs of climbing gyms and climbers, such as professional management support, education for climbing instructors, and holding events for the climbing people,” says Seonggyu Jin, the association’s current director. Prior to the association’s formation, gym owners in Korea were a disorganized and admittedly frustrated bunch. Other climbers’ collectives, most notably the Korea Mountaineering Federation, focus almost entirely on trips outdoors and crag development. The new association strives to grow gym culture and put climbing on par with mountaineering in the shared Korean consciousness. 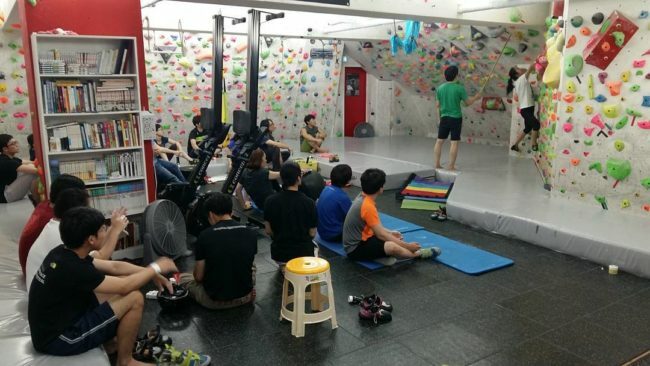 The Korea Sports Climbing Wall Association has quickly given Korean gym owners and aspiring owners unprecedented zeal, as well as connectivity to (and information about) each other and to trends in the global gym industry. New gyms have rapidly sprouted up—pushing the total number of gyms to 285 across the country. Ten new gyms are slated to open in the next two months. But when it comes to actually enticing would-be patrons to join these new gyms, owners have had undeniable help in recent years from IFSC superstar Jain Kim. Born near Seoul in 1988, Kim first started winning international lead and bouldering competitions in the early 2000s and went on to be become one of the most decorated female climbers of all time. What Kim has done is inspired a new cohort of Korean climbers with her celebrity status. She began reaching her greatest success around 2013, just as a large swath of the country’s youth was seeing climbing as an autonomous discipline that was fully separated from mountaineering—a line of thinking that differed from that of previous generations of climbers. And as much as Kim was being lauded on the world’s climbing stage then, her status in Korea was becoming that of a bonafide ambassador; she appeared in television profile pieces and advertisements, and this added further intrigue to the sport she was inadvertently showcasing. Along with her brothers, Jaha and Jabee, Kim opened The Ja’s Climbing Gym in Seoul’s swanky Gangnam district in 2013. Her success also paved the way for other Korean competitive climbers such as Jongwon Chon to carve out similar niches as well. Like Kim, Chong emerged as an IFSC standout and opened his own gym in Seoul last year — B.bloc Urban Climbing Gym. 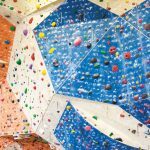 The Ja’s Climbing Gym, B.bloc, and more than 90 percent of the other indoor gyms in Korea, are bouldering-only and nestled in the heart of tightly-packed urban centers. 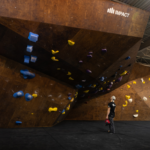 Most of Korea’s population lives in large metropolitan areas, so these smaller bouldering gyms are the most logical and economical route for the country’s ever-growing climbing community to pursue the activity. Lee notes that the mom-and-pop feel allows members to become a close-knit group. Although lacking in sprawling exercise and free-weight spaces, most Korean gyms have small pro shops and reading tables to help establish a communal atmosphere. Also, the gyms are minimalistic in workforce, frequently staffed by just a single employee or two at a time. “Because of the size — most Korean gyms being small compared to American gyms — naturally everyone including the staff and the members gets to know each other quickly,” Lee says. Full-service, corporate-owned gyms in the West often require several years of planning, fundraising and construction. Even a bouldering-only gym can be expected to take a year to complete. 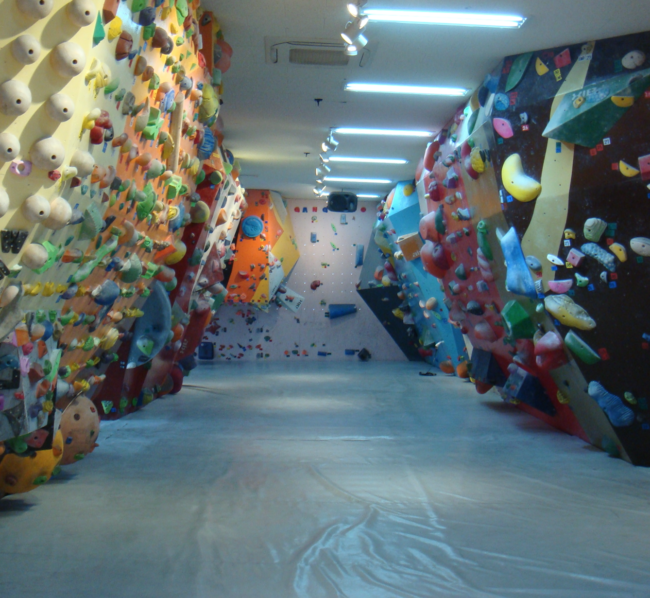 Korea’s bouldering gyms, on the other hand, are often constructed at much speedier paces. A smaller floor plan allows Korean owners to build facilities in pre-existing city retail spaces and avoid having to do more complicated construction like knocking out multiple floors to make way for high climbing walls. 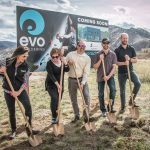 As an example of the expedited process, Lee first conceived of Candy Climbing in February, 2015, then began construction two months later, and opened the facility’s doors to customers in May — a mere four months for the gym to go from just being an idea to having its grand opening. 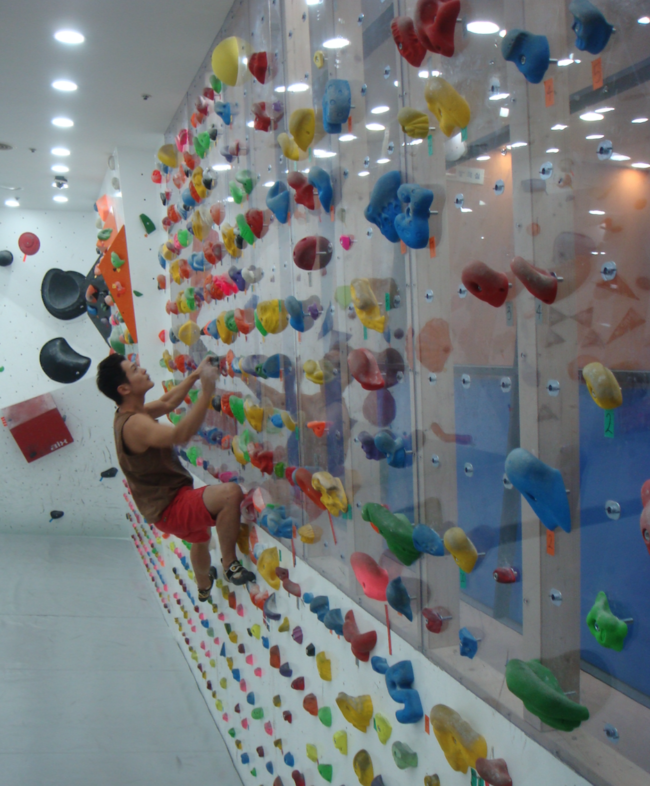 The interior of Ganseo Climbing gym which opened in 2015. Such swiftness, virtually unheard of in the U.S., is the norm in Korea. The price for creating a gym in Korea would be considered cheap by Western standards too, where gyms are frequently extravagant, multi-million dollar projects. In contrast, Korea’s bouldering gyms, particularly in Seoul, are usually created with a ballpark cost of 100-150 million Korean won. Those numbers sound lofty, but when converted, they equate to just around $100,000 USD for the entire construction process — and that cost skews even cheaper in secondary Korean cities. Lee points out that there are three major companies for gym owners to turn to for wall construction in Korea—Discovery, Vertical Limited, and Climbing Korea. However, costs generally run cheaper if gym owner hire the various workers—carpenters, hold makers, etc.—individually and without the commercial help. Korean gym owners can further lower costs by situating their facilities in the basements of buildings, capitalizing on cheaper real estate that simply wouldn’t appeal to other merchants—like restauranteurs or clothing retailers—who would want windows to draw in customers. So the question is, how do all these small, windowless bouldering gyms attract new customers? A climber boulders at Core Climbing Gym which recently opened in Seoul. “Social media is the main tool for attracting people,” says Lee. “Referrals from current members are helpful too. In the past, comps have also been good ways to boost publicity, but events lately haven’t brought in as many people.” Lee notes the lower attendance numbers for recent comps might be partly due to a rise in the popularity other fitness activities (primarily Pilates and yoga), and also the growing issue of climbing gym saturation—patrons now simply have many more gym options than they did a year ago. 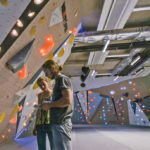 On the occasion that a new gym breaks from the trend and get financial backing from large corporate entities, such as the new Core Climbing Gym, which was financed by a large cinema company, they are still often assembled at a breakneck pace with sensible construction costs. Korea’s climbing boom comes with potential hiccups. The recent gym abundance hasn’t necessarily equated to additional professional opportunities for dedicated amateurs or would-be professional climbers. Young athletes are still tasked for financing their training entirely on their own, or more likely, obtaining financing from parents and gym owners. Also, the Korea Sports Climbing Wall Association hasn’t had time to achieve much in the short time since it was established. Those gym owners who are members of the association are still waiting to see what the exact long-term benefits will be of inclusion, and how effective the association will be in a country that is typically slow to break from tradition. 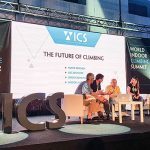 In the coming year, the association has ambitious plans to host a seminar on management efficiency, release various gym management plans, publish climbing books, and hold a “Youth Level Up” camp for young athletes. Time will tell when, or if, those services see the light of day. Nearly every gym owner hopes that the next summer Olympics will help publicize climbing and attract additional patrons, but Korea is still admittedly behind countries like Germany and Japan in support for young climbers and would-be Olympians. Still, many gym owners are optimistic that the current climbing boom will continue. Author’s note: Zooey Ahn aided in translations for this piece. John Burgman lives on the small island of Jeju in South Korea, where he teaches at Jeju National University. He is the author of a book, Why We Climb, and frequently writes about indoor climbing. This is his first article for CBJ.